DETAILS: This stunning home features 5 bedrooms, 4.5 bathrooms, and an impressive outdoor oasis—all designed for your perfect 30A getaway. 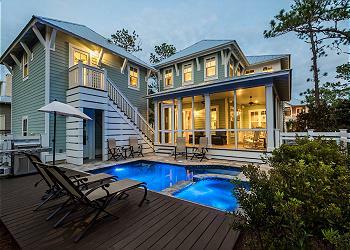 Guests are welcomed with the home’s beautiful exterior furnishings and warm interior design. The first level offers a spacious open floorplan where the living, dining, and kitchen areas offer an impeccable entertaining space. Gorgeous hardwood floors and bright shiplap walls accentuate the natural light in this area, which pours in from the large windows surrounding the main level. The gourmet kitchen is a perfect gathering place in the home and features custom cabinetry, top-of-the-line stainless steel appliances, granite countertops, and a large kitchen island. The nearby dining area offers a beautifully appointed table with seating for eight, and guests can enjoy four additional seats at the breakfast bar. Luxurious seating and a large, mounted flat-screen television await in the living area and provide a relaxing place to unwind. The first floor also features a lovely guest room with a king bed, transom windows, and an en suite bathroom with a marble vanity and glass-front shower. Also on the first floor is a queen guestroom. Atop the stairs to the second floor is a beautifully decorated and cozy second living area, complete with a comfortable queen sleeper sofa and a large flat-screen television. The second floor is home to the expansive and dreamy master suite, which features a lavish upholstered king bed, a comfortable sofa and armchair/ottoman set, and a large flat-screen television. Guests in this room will enjoy the French doors to access the second-floor balcony, as well as the en suite private bathroom, which features a glass-front shower and dual marble vanities separated by a relaxing spa tub. Also on the second floor is a queen bed guestroom featuring a private bathroom and shower/tub combo. and the other offering a shared bathroom. In the bunk area down the hall are two built-in twin-over-twin bunk beds dressed in luxurious linens, providing perfect accommodations for the younger guests in your group. The home’s spacious porches provide abundant space to relax and enjoy the beautiful neighborhood views and the home’s tree-lined backyard space. A large screened porch sits adjacent to the private pool and spa tub, and ample outdoor seating surrounds the outdoor oasis. 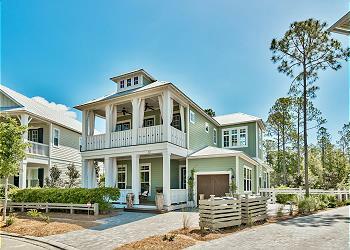 Book your dream vacation at 12 Pine Lily Circle by contacting 360 Blue today! The house is beautiful! Loved the backyard ... roomy .. nice pool.. private. Always love renting through 360 blue! We are so glad you all had yet another successful stay with us in Watercolor at this amazing home! We agree that this home is the perfect spot to sit back and relax! Thank you for continuing to stay with 360 Blue, we hope to see you again soon! Amazing experience! 360 Blue was wonderful to work with and the house was beyond perfect. Lots of space for our family (6 adults and 3 children) and gorgeous furnishings. We are more than thrilled to hear how much you enjoyed your vacation with us in Watercolor! We agree that this home is a wonderful option for a larger group or family! Thank you for choosing 360 Blue, we look forward to seeing you all again soon!